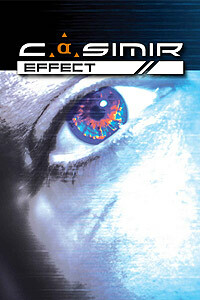 Casimir Effect (2011) - Sci-fi-central.com. UK  2011  60m   Directed by: Gabriel Strange-Wood, Lydia Wood.  Starring: Gareth David-Lloyd, Gemma James, John Jenner, Zoe Mills, Clay Paulsson, Neil Rayment, Suzie Rees, Peter Owen Williams.. In the year 2101, Dr Alice Sharpe is the first person to travel through time, but a mistake in the calculations leads to a paradox that could destroy time itself. Alice is thrown 100 years forward to nightmare future, the only clues to her predicament are a letter from herself she doesn't remember writing and another from her grandfather. Alice learns that with the help of Iolanthe the city's AI, she must travel back in time to change the course of the past.